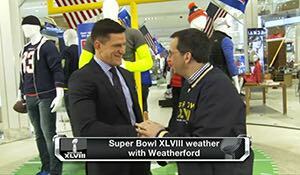 Viewers of NFL AM on the NFL Network were entertained by a great location segment from Herald Square in New York City with Steve Weatherford and Dave Price. The New York Giants punter and meteorologist talked about the weather and windy conditions at MetLife Stadium for Super Bowl XLVIII and also about the cover of our upcoming issue. 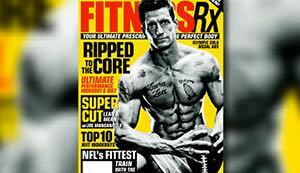 You see, Weatherford and his ripped physique exploded onto the screen when the cover image for our March 2014 issue (on newsstands everywhere tomorrow) was shown. Price had some fun with Weatherford and a good time was had by all. Of course, the rest of the four-hour program was a hit, as well. The popular morning show is chaired by the lovely Nicole Zaloumis, who is joined every weekday (6 AM to 10 AM EST) by Steve Wyche, Eric Davis and Mark Kriegel. 1 – Fox Sports “Afternoon Huddle” with Chris Myers and Matt Hasselbeck on 1/27/14. 2 – ESPN First Take with Stephen A. Smith and Skip Bayless on 1/28/14. 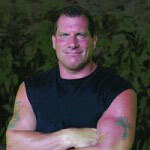 3 – The Bethany Frankel Show (TBA).